Did you know that emotions boost our memory? Or that small muscle exercises help the brain develop? Early experiences contribute to the structure of the brain and its capacities. The quality, quantity, and consistency of stimulation will determine, to a large extent, the number of brain synapses that are formed and how those connections will function. This is true for both cognitive and emotional development, and the effect is lifelong. 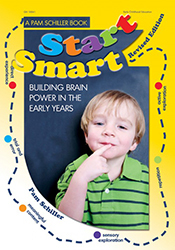 Start Smart offers simple, straightforward ways to boost brain power with active exploration, repetition, sensory exploration, and direct experience. Revised to reflect the latest research about how children learn, the new edition of this classic bestseller offers explanations on how and why these activities help the brain develop. The layout has been updated, and the illustrations are now in color.